Welcome to the North Pole and South Pole's page. On this page we will share the exciting things we learn about, the places we go and the events we take part in. Key information about the curriculum can also be found on the Curriculum Overview page. Teaching Assistants: Mrs Clark, Mrs Wilkinson, Mrs Rowlands and Mrs Oddie. As part of our topic for Winter the children looked at snowflakes and how these are all different. They created their own using small parts. The children in the foundation stage visited the Life Bus. They learned all about their bodies and keeping healthy. The children got very excited when Harold the Giraffe arrived and sang a special song to them They had the opportunity to help him get ready for his day at nursery. Today was such a rainy day that the only thing to do was to get the bubbles out. The children had a great time blowing bubbles of all sizes, trying to catch them and then watching them float away into the sky. 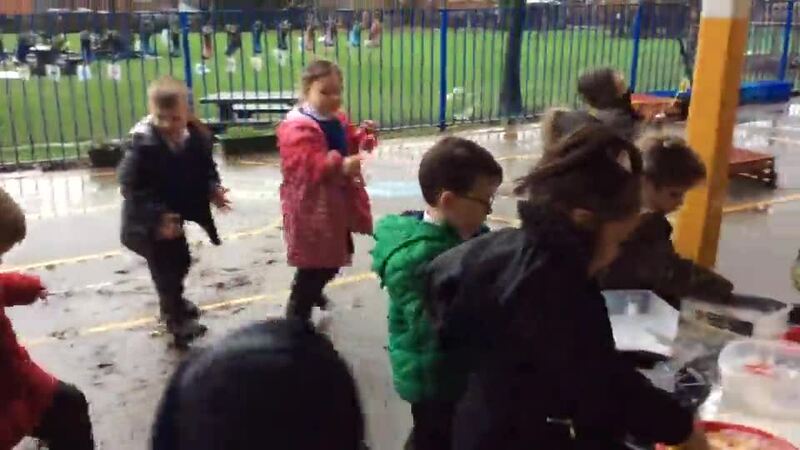 The bubbles brought such joy and excitement on a dreary day. 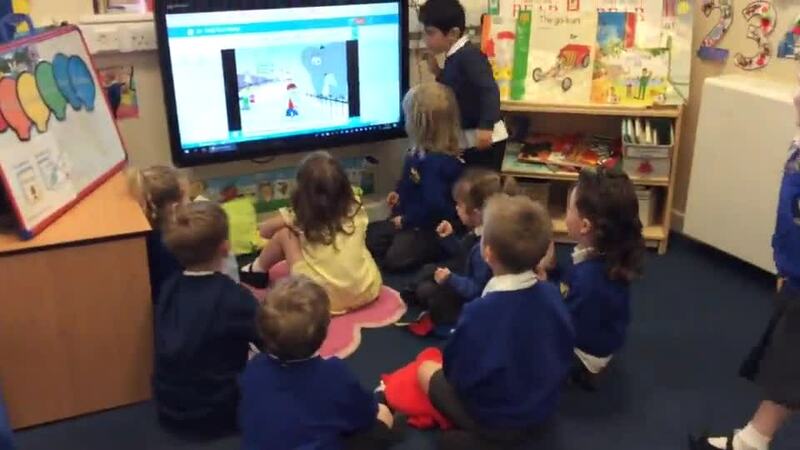 The children in Nursery invited their parents into school to show them what their learning looks like. First the parents watched whilst the children had their phonics session. Today was instrumental sounds. Following this, the children helped their grown ups to make a music shaker using pulses, rice, popcorn and not forgetting the important ingredient, glitter! As it is almost Christmas the children decorated a Christmas bauble and took them home to hang on their tree. The children in the foundation stage unit learned all about harvest by reading the story Stone Soup. They brought in one vegetable and together made soup to share. They also baked bread shaped like hedgehogs and to finish this topic they performed an assembly for the school and parents, telling them why harvest is so important. Mrs Rowlands talked about the Porch Project and how this helps people in need in the community. 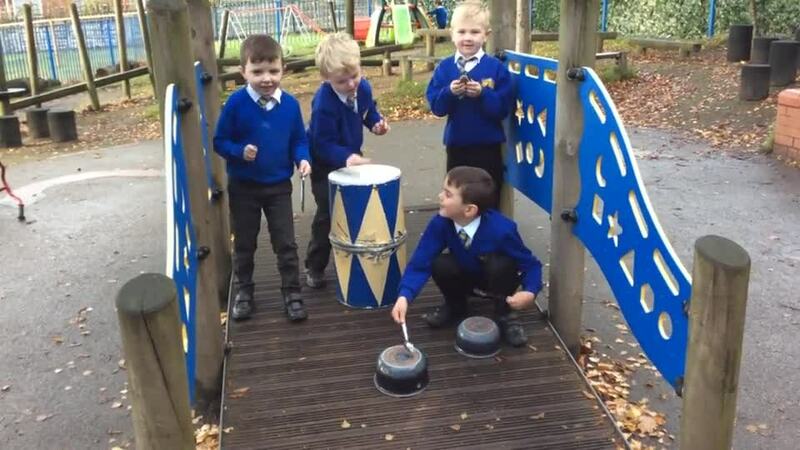 The outdoor area is a vital part of the children's learning. 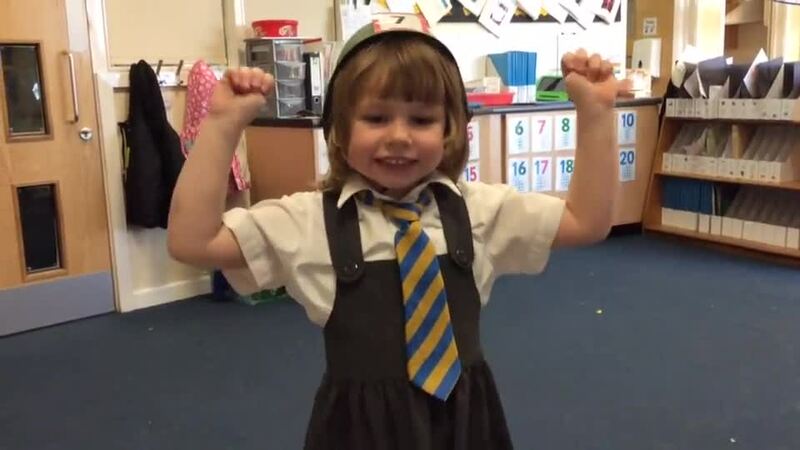 They enjoy the variety of activities that are available each day, including maths, mark making, balancing, playing cooperatively with others, problem solving, gross motor development and making music. The goats also give the children the opportunity to care and nurture living things. In the Foundation Stage we acknowledge the importance of celebrating the children's individual birthdays. Every child bakes and decorates their own cake with a group of friends. We collect fresh eggs from our school chickens. This is then shared and enjoyed with the class. In the foundation stage the children work on their early writing skills within the continuous provision with support from the staff. Early writing comes in many forms e.g. painting, whiteboards, pattern making, story scribing, threading and making marks in sand. Outdoors we can run, jump, balance, explore and use our imagination in role play situations. We also learn how to problem solve and to be persistent when a challenge occurs. We had a visit from the Life Education Bus this week. The children learnt all about their bodies, staying healthy and safe and how to exercise their hearts to keep them healthy. The children also got to meet Harold the Giraffe. They helped him get ready for his busy day at nursery by brushing his hair, brushing his teeth and helping him have a wash. It was such a fun experience and the children had a great time. Why do the horses have long tails? Have they got their shoes on? We found out that the horses love to eat grass and hay and even a burger!! The children were also surprised to discover that the horses did not have shoes on their feet. Arctic Foxes said that all horses wear shoes! It was explained to them that the horses had really strong feet and that is why they did not need shoes. Thank you to Caden and Edie Blundell’s Mum for bringing them into school. In Early Years we love counting and singing number rhymes whilst we are playing. We had a special visitor when we had our Christmas party. Today the children made pancakes. They measured the ingredients, mixed them together, tossed them in a pan and then ate them. The children in FS2 used excellent counting and reasoning skills in maths. They used the counters to cover their elephants and then had to explain why each elephant had different amounts of counters on them after they had counting each set. We celebrated World Book Day by dressing up as our favourite book character and sharing our books from home with our friends. The weather has started to get cold and frosty so we decided to go on a walk around the school grounds and see what we could find. The children had a fantastic time playing in the snow and the goats enjoyed it too. We had a lovely time celebrating Mother's Day with our Mums, Grandmas, Nanas, Aunties and even Dads. The children spent time making cupcakes and decorating them, creating and writing cards and learning a special song to perform during the afternoon. A big thank you to everyone who helped us celebrate. We love to come to school and learn by exploring and socialising with our friends. Arctic Foxes enjoyed a session of Bikeability. We gained practical skills and understanding of how to cycle on today’s roads. We also learnt the skills and confidence for all kinds of cycling. The children in nursery have been learning about 2d shapes this week. They learnt the names and properties of a triangle, circle, square and rectangle. They then went outside to find these shapes in the environment. As you can see they found lots of 2d shapes amongst everyday objects. The children in Foundation Stage enjoy socialising and making friends. The love to help each other and and work together. This week we have been reading Handa’s Surprise in class. We have been learning all about the different animals in the story and the country that the story is set in. The children looked at the map of the world and we talked about where we live in England and then found Africa on the map. In the story Handa takes a delicious basket of fruits to her friend Akeeyo but along the way the animals steal the fruits one by one. As the children hadn’t tasted some of these fruits before we decided to try them and choose our favourite. The fruits we tried were banana, orange, pineapple, mango, passion fruit, papaya and avacado. The children got together today during choosing time to perform some rhymes. They made decisions together and chose to sing “If You’re Happy and You Know It”. This activity was such fun that it encouraged others to come along and join in too. The children in foundation stage had a fantastic time at Blackpool Zoo.They saw lots of animals and watched the sea lion show. The weather was great too. Winter: The children have been thinking about the type of clothing they wear when it is cold outside and what these are made of. They have also looked at where wool comes from and how it is made. Bears: real and fiction bears with lots of stories. The children have been learning about the different types of bears including the brown bear, the sun bear and the polar bear. They have also looked at where these bears live. Space: The children will be reading lots of stories about space and aliens including Aliens Love Underpants and Whatever Next. In nursery we have been learning about outer space. We read some really exciting stories such as Whatever Next! and Aliens Love Underpants but our favourite was Aliens Love Underpants Save the World. We acted out the story of Whatever Next and we pretended to have a picnic on the moon. We also made a huge pair of underpants by sticking together lots of small pairs. We then counted how many pairs we had altogether. It was 24! In science we made planets using milk. It was just like magic when the colour started to move about on the surface when we put the soap in. We also made aliens using the playdough and then gave them silly names. In Letters and Sounds we made some rhyme rockets. We decorated a bottle and then we chose three pictures that rhymed to stick onto them. We visited the farm as part of our topic for growing and farms. Although the weather was really cold we had a fantastic time. We fed the animals, rode a pony, held small animals and learnt about the animals from the farmer. After a long day we had a play in the play barn after lunch. As part of our topic for growing and farms we made vegetable soup. We prepared the vegetables by chopping them up and then after we cooked the soup we ate it with crusty bread. It was delicious!! The children in Arctic Bears love to use blocks during their play. We have used them to measure the beanstalks. We counted how many blocks were as tall as the beanstalk. We even measured our friends with them. After hatching our chicken eggs we now have to look after them in our school chicken coop. The children love visiting them everyday to feed them and top up their water. The chickens are really friendly and love to have special treats like lettuce, cucumber, apples and sweetcorn. To see a video of the chickens hatching visit the School Events. A big thank you to Roddy's Mum who brought in six kittens to show the children. They are only five weeks old. You can see how much the children loved this experience by the huge smiles on their faces.